The saga of the Cryptocurrency Bitcoin from values approaching $20,000 at the end of 2017 to a steady loss of more than third of that value continues. The overall numbers over the first 10 months of this year would test the patience of even the most optimistic market bulls, but the bears continue growl at the possibility of an even lower dip in value by year’s end. A recent post on PlaySlots4RealMoney.com helps put the entire fate of the cryptocurrency market in sharper focus. Over the past few days of trading, the value of Bitcoin cryptocurrency has dipped below $100 billion in market cap fueled by its continued loss in value. Following a brief rally earlier in November, this was the second time this has happened in less than a month when Bitcoin dipped below the $100 billion level on Oct. 29. Will The Price of Bitcoin Improve For 2018? The bulls have not been able to sustain any traction in the market with those earlier gains and the $6000 bottom for Bitcoin was recently breached when the trading price fell all the way to $5,600 earlier this week. Things have remained a bit more stable in recent trading, but the bears are in control in what could be a temporary lull in volatility. XRP’s decline in recent trading was a more moderate -7.8 percent. One of the driving factors in this latest market decline is Bitcoin Cash undergoing a hard fork that will result in two different chains. The first will be Bitcoin Cash ABC, which will be referred to as BCHABC. The second is Bitcoin Cash SV which will be BCHSV. This move alone has created quite a bit of uncertainty in the crypto market. The Upcoming Fork: How Will It Accept The Price Of Bitcoin & Other Cryptos? This upcoming fork can be can directly attributed to the deeper loss in value for Bitcoin. It also causes investors to trade other altcoin tokens to buy Bitcoin at a lower price. 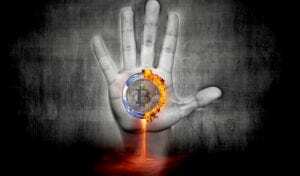 The dual action can negatively impact the value of Bitcoin as well as the altcoin market. This is just one of the reasons for the overall decline in cryptos in recent trading. The market has been trending down all year long. Brief bull runs are often followed by longer bear adjustments with the net value ending up lower than it previously was. The bottom levels for Bitcoin continue to move in the wrong direction once the $8,000 and $7,000 mark were breached. The $6,000 bottom was thought to be the low point, but with the value 400 points below that level in recent trading, bears could be eyeing $5,000 as the next market threshold. • Source: Bitcoin and the crypto market is once again crashing hard From techcrunch.com On November 15, 2018. Ultimately, Satoshi Nakamoto is still anonymous but most people think he is Roger Ver, who created this open source digital currency and blockchain technology. If you are looking for a private key, we recommend you visit the price index at a bitcoin exchange. PlaySlots4RealMoney.com does not cover bitcoin legality. If you have any legal questions, please consult an attorney. This includes but is not limited to venture capital, bitcoin cash, smart contracts, distributed ledger, computing power, and a central bank. Bitcoin Bettors See The Crypto Market Continue its Steady Downward Slide. Will The Price of Bitcoin Improve For 2018? 2019 Bitcoin Predictions.